In the era of deadly sexually transmitted diseases, these illustrations provide an answer to the question: "How do I protect myself?" The illustrations are from "Anansi & Drybones". The story is my contemporary cautionary tale about the AIDS epidemic and one way to be protected from venereal diseases. 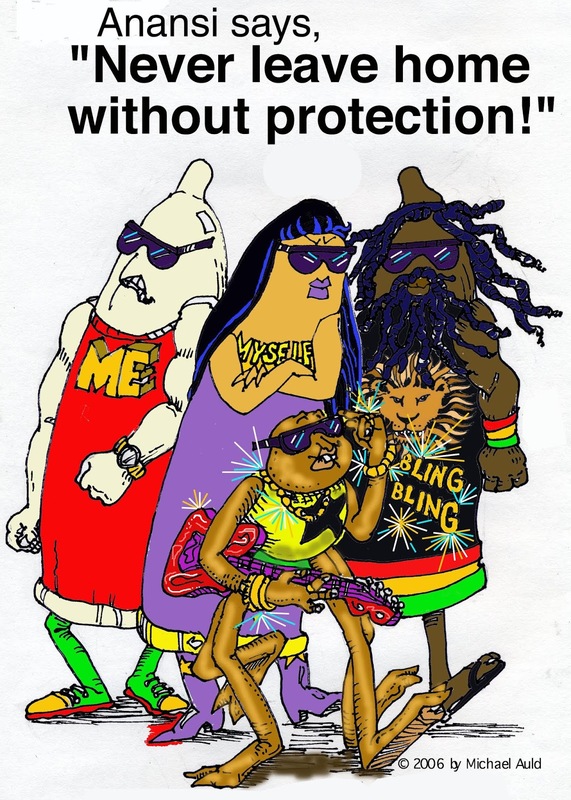 Left: In this ending panel of the story Anansi is the "lead musician" with his Back-Up Reggae Band, "Me, Myself and I&I", who are varicolored self-protecting condoms. 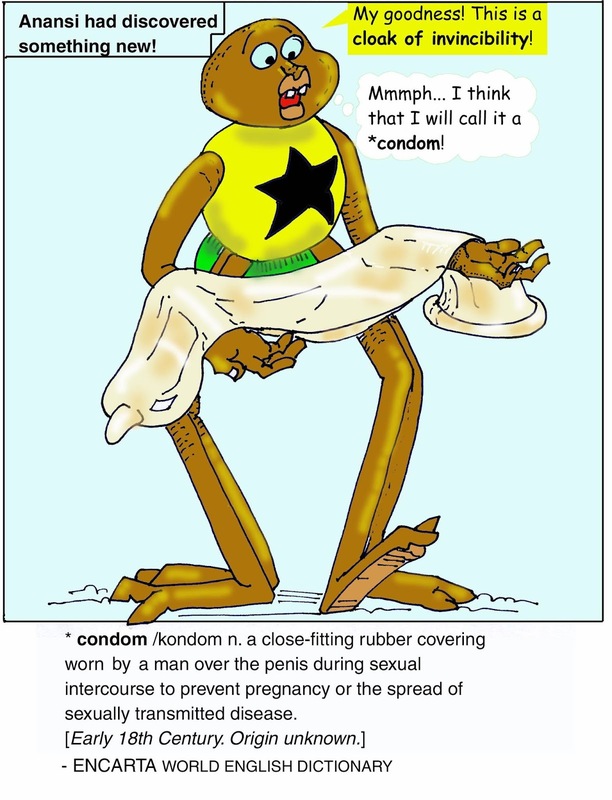 Right: The story concludes with Anansi displaying a condom that had covered him during the story and saved his life from "King Drybones" a.k.a "Bro' Death". The latex condom becomes " The Cloak of Invincibility". Arachnid: Western scientific classification for spiders. From Greek mythology. Arachne was a woman weaver jealously turned into a spider by the goddess, Athena. The reverence for spiders is worldwide. While, for some, the fear of spiders is real. Yet, many societies regard these arachnids with awe and respect. Especially those spider characters that appear to have human or god-like qualities. These hybrid demigods often belong to this class of deities with supernatural powers. Identified as "the quencher of storms" (Anansi of Ghana), "the bringer of light" (Grandmother Spider of the Cherokee), "present at the time of the Creation (Spider Woman of the Hopi)", a spiritual communicator (Iktomi of the Lakota), as the organizer of communities, or as a "trickster" (Anansi & Iktomi), and other times as "grandmother”. A spiderweb placed in a fresh wound can heal. In the Andes spiderwebs are known to capture hummingbirds. Philosophically, for the Asanti's Anansi, the structure of the web taught community building; for the Hopi of the American Southwest's Spider Woman, the web's strands connected us all by the forehead, disturb one filament and the vibrations are felt by all. For this reason it was dubbed “The Web of Life”. This Hopi observation of one use by the spider’s web to be a sensory notified by the strands, that food is at hand, was a demonstration to be learned in Nature and applied to how we solitary beings are affected by the actions of another. When the telegraph was introduced on the Plains, it’s wiring seemed to the indigenous people to be a reflection of the spider’s communicative web. The WWW was well named, for its Internet connectivity is a contemporary manifestation of the Hopi’s concept of human interactivity. In the Anansi tradition, the spider's web can be a symbol of the sun's life-giving radiating light. To the Hopi of New Mexico, the colors reflected by the web filament were colors present at the Creation. Among the Cherokee, Grandmother Spider's web instructed humans how to weave and how to make pots out of coils of clay. Before the telegraph's wires or the World Wide Web it was the spider who showed humans how to connect with each other and form communities. Iktomi of the Lakota, located on the North American Prairie, is perceived as, although a trickster, he helps children. The Asanti (or Ashanti) of West Africa believe that Kweku Anansi began his life as a man who became a spider-man because of his annoying antics towards his father, N'yane the sky god. As a spider-man, he continued to provide valuable life lessons to both the young and old. Cursed by his father for disobedience, he was turned into a small spider, forced to fend off larger creatures with his brain power. His AnansiStories or Anansesem, often told by elders, continued to teach morals by example. These morals have served the Jamaican code of ethics for centuries. Anansi also uses his brain as a survival tool. "Kweku" in the Akan language translates as Friday, the name of the day on which he was born. While "Anansi" means "spider". As the son of the Great Sky God, N'yame and his wife, Asase Ya, the Earth Mother, Anansi is portrayed as half "man" and half spider, yet he actually originated as supernatural royalty. His duality allows him to live among human and other animals indulging in all their identifiable personalities as if he were one of them. Sometimes the physical characteristics of an animal is ascribed to him but he can easily transition into a human with accompanying faults. In Jamaican lore, Ansnsi may or may not be married to Cookie whose Ashanti name was Aso. Only one of his many children’s names, Intikua, (known as Takooma in the island, was retained in Jamaican stories, sometimes as an adversary or as an independent character. Stories about Anansi's exploits change from one tale to another. Sometimes he is portrayed as a villain or as a hero. In his stories his brilliance to circumvent dilemmas, change his fortunes or fall victim to his own antics are dependent on each situation that he has been backed into, often by choice. An avid observer, he is always using his brains to maneuver through daunting tasks. Win some, lose some is the hallmark of a well told Anansesem, or "AnansiStorories". Jamaicans describe him in a proverb that states, "Him likkle, but him talawa!" Or, "He may be little, but he is tough." Although this description fits him well, in some stories he is a competitive bachelor who vies for the king's daughter’s hand or he may be an unfortunate looser who dies. Whatever his fate, Anansi's plight is often seen as getting his just dessert or escaping with his life. In many of these Jamaican stories the search for food is a common theme. What is most important in his exploits is that a valuable lesson is learned at the story's end. Anansi's personality is defined by the storytellers who, for centuries, have used him as a moral guide. In Jamaican Anansi stories, the listener knows when Anansi speaks since the storyteller's voice mimics the spider-man's speech, often with a type peculiar to the island’s way of childish speaking. For example, “little” is pronounced child-like as “yik-key”. He is identified as a trickster, not unlike Iktomi the Spider-fairy, a Lakota figure of the American Prairies who is described as "better dressed than any Sioux warrior". Iktomi, for all his pranks, is seen as a friend to humans. In contrast, the small Anansi is seen as a competitive survivor who uses brain over brawn. constellation superimposed within its shape. The most impressive visual rendering of a spider comes from Peru's Nazca of South America. Their visual interpretation of the arachnid can only be seen from a bird's eye view. This imagery begs the question, could the Nazca physically or spiritually able to fly? Or were they helped by alien beings as some extra terrestrial theorists believe? This line of thinking undervalues ancient people and their potential for accomplishing little understood feats. The shape of the Nazca spider reveals points on the legs and body that seem to mirror star formations. 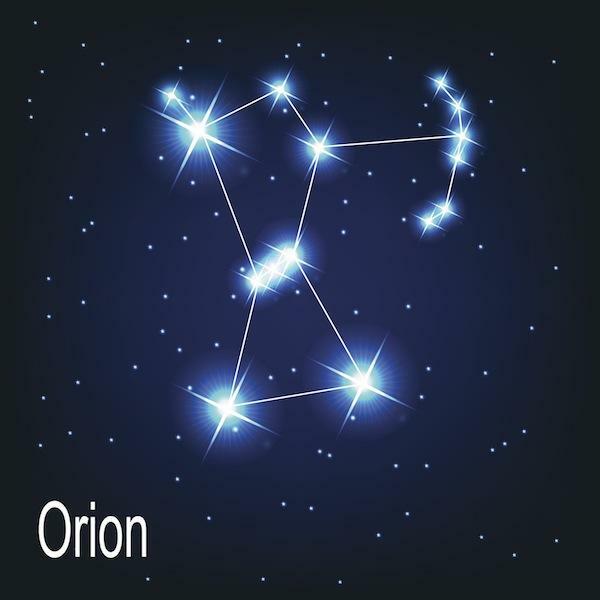 The points of the spider's body reveals the shape of the Orion constellation. The star's location appears at the tip of one extended right leg of the spider. (See the Nazca image). A bird's eye views of terrestrial phenomena is found on ceramic pots by the Taino of the Caribbean whose ancient imaging of the hurricane was seen as "S" shaped as was later learned from satellite photography. Similarly, the Native American's name for the North American continent is "Turtle Island, because from the air the continent's shape can fit into a turtle's shape, head, legs and back.. The fact that the spider rated so importantly in the Nazca belief system, is not surprising for the arachnid is similarly featured in other world cultures. Birds such as the condor and hummingbird, like the spider, also obviously had an important place in Nazca mythology. Usually, these animals' abilities were explanations for natural phenomena. For the ancient Egyptians, the ibis god, Thoth, only had to speak into the darkness of space, "Let there be light", and the power of the sun lit up the dark universe. For the Jews it was the omnipotent Yawe who also said in Genesis, "Let there be light." For the Cherokee it was Grandmother Spider who transported the sun's light to the dark side of our planet. The Hopi believed that Spider Woman was present at the Creation and her brilliant web connects all beings, animate or inanimate. The term "the Web of Life" reflects the importance of the spider's weaving ability that taught humans how to make cloth, netting, bags, ceramic pot, a house and how to form a community. Similarly, Spider Woman's web's connectivity is echoed by Anansi's example for human community-building. The use of the Internet's World Wide Web term is a reflection of contemporary Internet connectivity. Maybe some spider’s stealthy movements or their potential poisonous bite trigger a feeling fear, however, they have engendered awe since ancient times. Stories about their exploits continue to place them in the role of teacher. ANANSI STORIES CONTINUE; Here characters, Anansi's son, Ticky-Ticky (left) and his high school buddy, Iggi Iguana, sit under a Duppy Balloon tree in present-day Jamaica. Ticky-Ticky goes on a quest to follow his father's search for relatives in North America. From the book "Ticky-Ticky's Quest: Search for Kweku Anansi" (anansistories.com). Does this topic interest you? BLOG'S HEADER: This blog's header is a combined image of my identity as a Yamaye (Yam-ah-yeah) with a design of Gwabance (Gwa-ban-say)= Angry Wind Goddess of the Taino superimposed over hurricane Katrina. To the precolumbian Taino women the image of the huracan was the same shape as a satellite view of a hurricane. SCULPTURAL IMAGE: My sculpture above is titled "Bohiti Mucaro". In Taino it means "Shaman Owl". To me it represents my respect for the mysteries locked in ancient Amerindian knowledge. The image is based on the bird-man sculpture found in a cave in Jamaica in the 18th century and now resides in England.